The opening night reception for the death penalty art show was an exciting night. Many of the artists were present, some traveling from other states, including Melinda Wing from Arizona and Rita Fuchsberg from Vermont. “Best in Show” ($500) went to Isabelle Heitzmann of Paris, France for “Lethal Injection (Barbie Jail Fun series)”, mixed media, 28x30x61 cm. Artist’s Audio Statement. Second place ($250) went to Annie Feldmeier Adams of Chicago for “Last Supper Trading Cards”, cardstock and ink, 3.25″ x 4.25″, set of 52 cards. Artist’s Audio Statement. Third place ($175) was Jason Archer of Austin for “War Tribunal”, Giclee Print, 24 x 16 in. Artist’s Audio Statement. Two merit awards of $50 each went to Mark Jenkinson of New York City for “Ricky Langley”, Digital C print, 30 X 40 inches. Artist’s Audio Statement. and Thomas Buchner of Germany for his series “World Wide Patent Fig. 1, 2, 3”; Adhesive tape on printed drawing, 29,8 cm x 21 cm. Artist’s audio statement. The jury also gave an award for “Best Work by an Artist on Death Row” ($175), which went to Robert Perez, who is on Texas’ Death Row for his two pencil drawings, “Texas Executioner”, 22×14 and “Yellow Rose for Friendship”, 14×12 in. The “Viewers Choice Award” ($100), which was selected by a vote of the opening night reception attendees, went to Ben Woitena of Houston for his work “Dead Man Walking” of painted steel, masonite, plexiglass, photo-montage & xerox copies, 39-38″H x 27″W x 3-1/4″D. Artist’s Audio Statement: Artist’s Audio Statement. Sometime this week, we will have all the images online at www.deathpenaltyartshow.org. 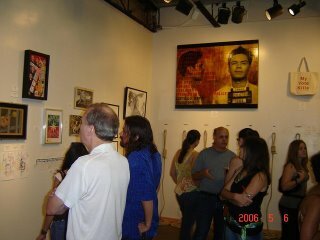 The artshow runs through May 22 at Gallery Lombardi in Austin, 910 West Third Street. Hours are noon to 6 PM, Tuesday through Saturday. On May 11 at 7 PM, there will be a gallery talk conducted by one of the jurors, Annette Carlozzi, curator of contemporary and American art at the Blanton Museum. The gallery talk will be held at Gallery Lombardi.